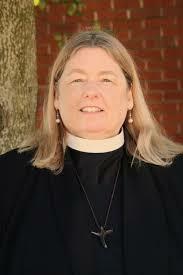 The Reverend Patricia Sexton was called by All Saints’ in October 2011 to be our Rector. Patricia holds a Bachelor’s degree in Philosophy from SUNY/Buffalo, a Juris Doctor degree from Case Western Reserve University School of Law, and a Master in Divinity degree from Virginia Theological Seminary. Patricia worked for 17 years as an attorney in the U.S. Virgin Islands and Boston, MA, specializing in Immigration Law, representing clients from over 90 countries. She then felt called to work of a different nature, and worked for 14 years as a High School humanities faculty member and HS Administrator in a private K-12 school in Boulder, CO. During her time in Colorado she also volunteered for five years at the women’s prison in Denver. Patricia discovered the Episcopal Church later in her life, and was startled and amazed by the fervent and persistent call to priesthood she experienced. She is grateful for the loving support of her home parish and diocese in Colorado and especially for the wonderful and extraordinary experience of her three years in seminary . Being the Rector of All Saints’ Cayce has been a labor of love and an opportunity for learning and grace for all of us who are called to relationship with Christ through this parish community. I have been a member of All Saints’ Episcopal Church since 1975. I began to serve as organist and choir director in 1994. I hold a Bachelor of Science degree in music education with an emphasis on piano from Winthrop College. All Saints’ has been a blessing to me for many years. I took the job as music director not knowing whether it was what I wanted to do, or not. It was one of the wisest decisions I have ever made. I love this church, and I love making music here with my friends. We strive to present a very Holy Eucharist.